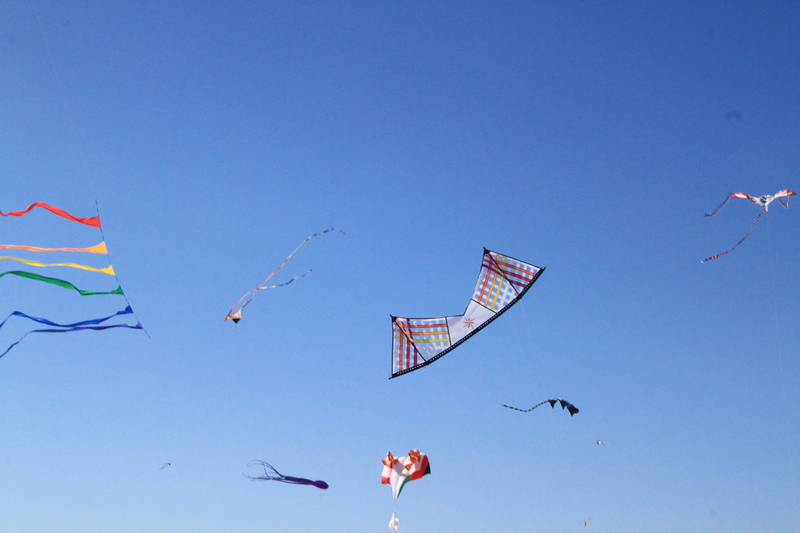 You are currently browsing the tag archive for the ‘Kite Festival’ tag. Our long and very pleasant stay with our daughter, grandson and very new granddaughter has come to an end. 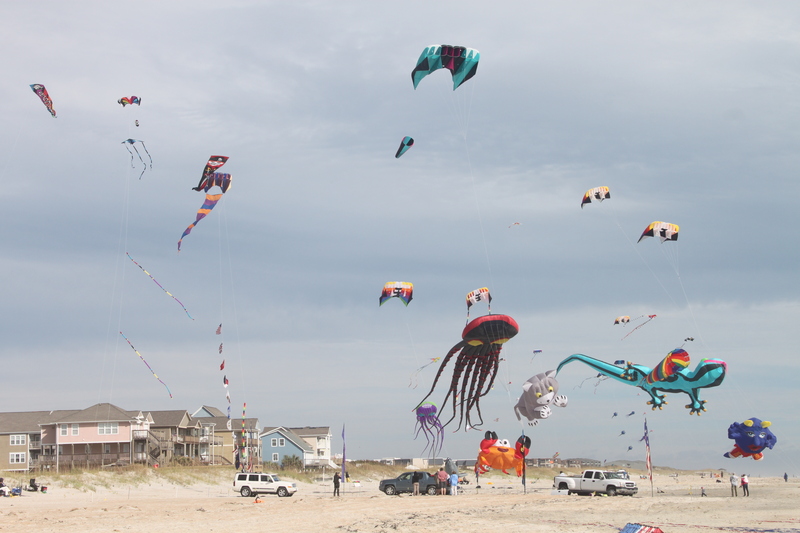 We were sent home and told under no circumstances were we to miss the Carolina Kite Festival in Atlantic Beach, NC. 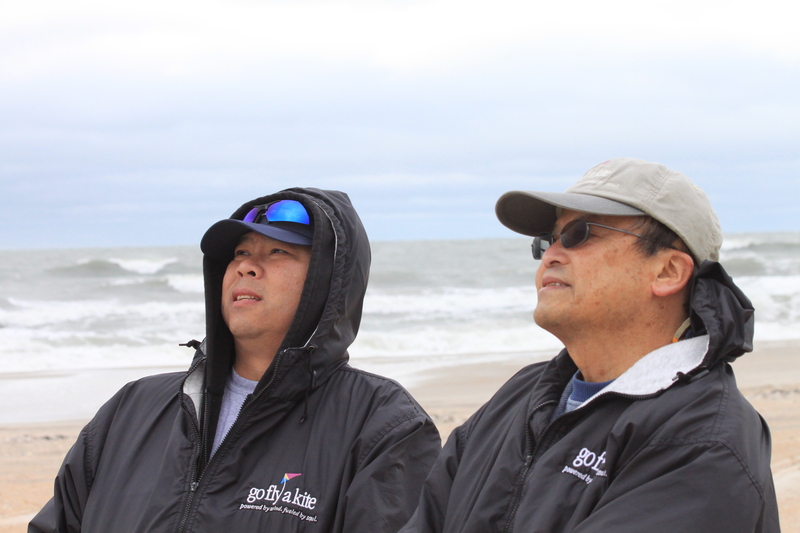 Our kite flying hiatus has come to an end in a very big way. 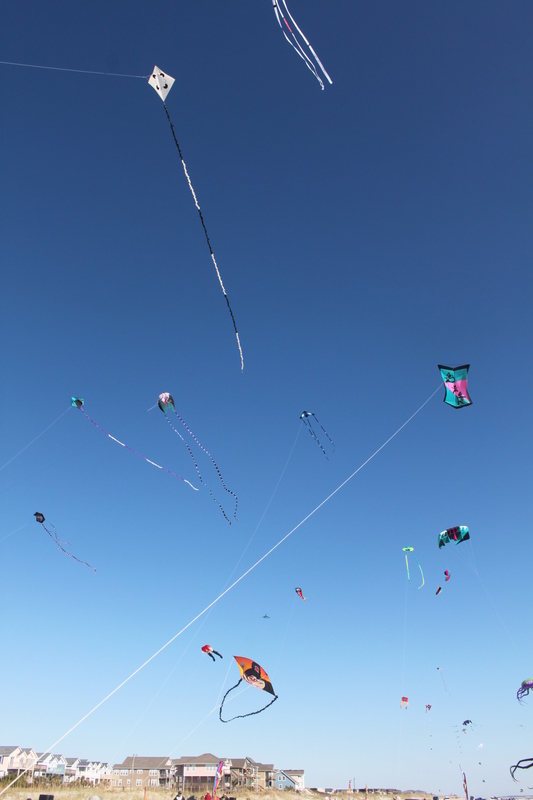 Two days of endless kite flying, old kiting friendships renewed and new kiting friendships made. 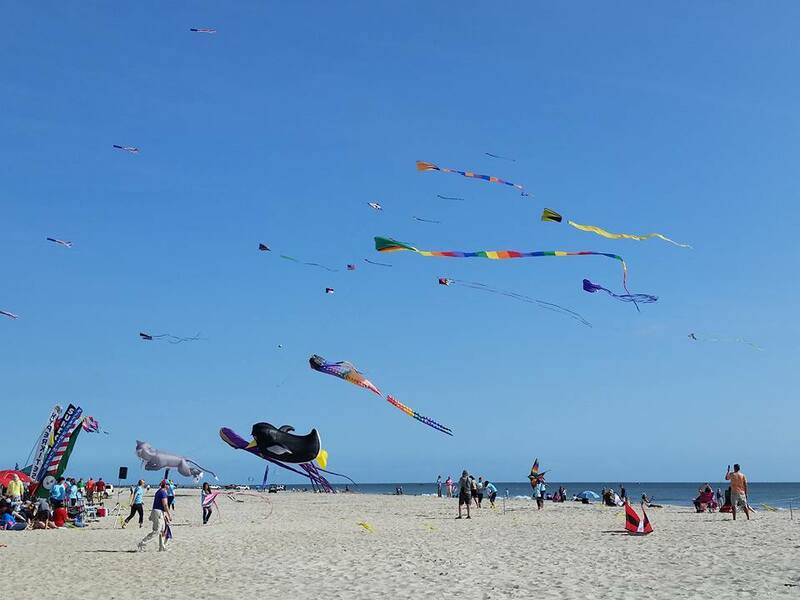 The Carolina Kite Festival was held this past weekend. 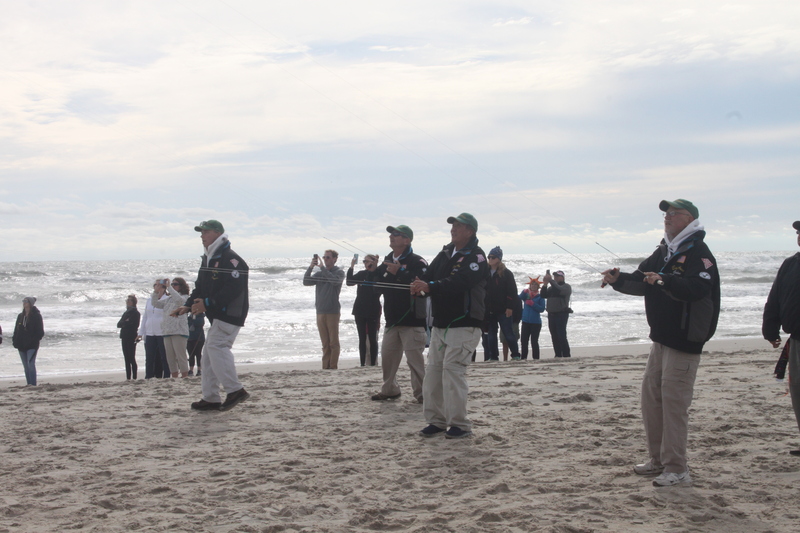 The temperatures were perfect and the winds were obliging most of the time. Saturday’s winds were perfect in range though a little gusty. 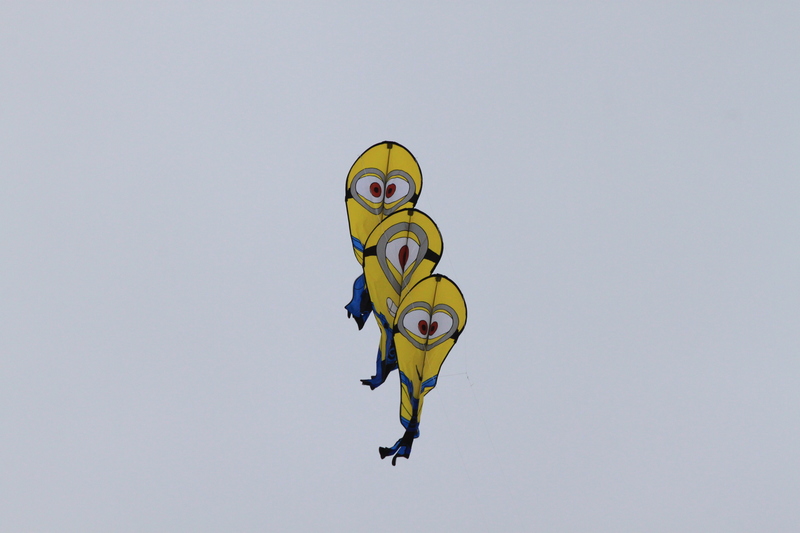 Large inflatable kites were flying at one end of the beach all day. 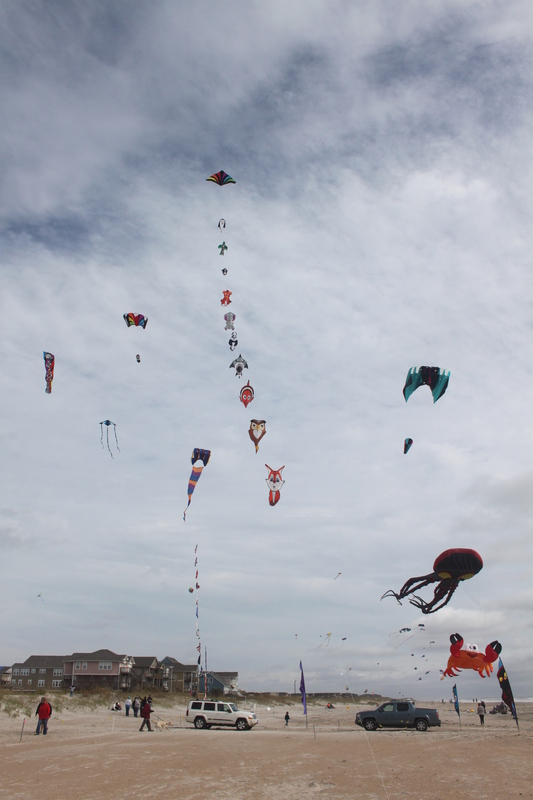 There were mass ascensions of many types of kites and performances by the kiting celebrity guests and some local talent. 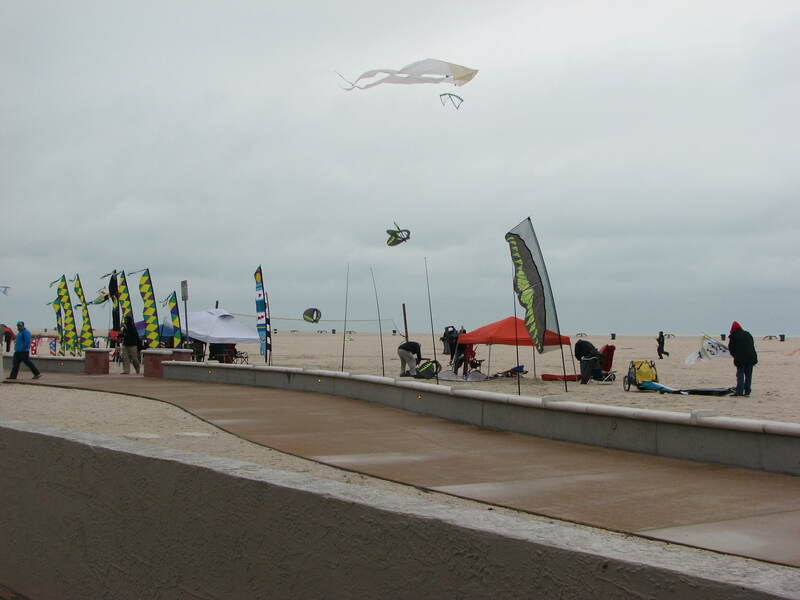 The Bay Area Sundowners, a stunt kite performance team from San Francisco, CA, flew several routines with their trains of Hyperkites. They are regular guests at the festival and people look forward to seeing them each year. 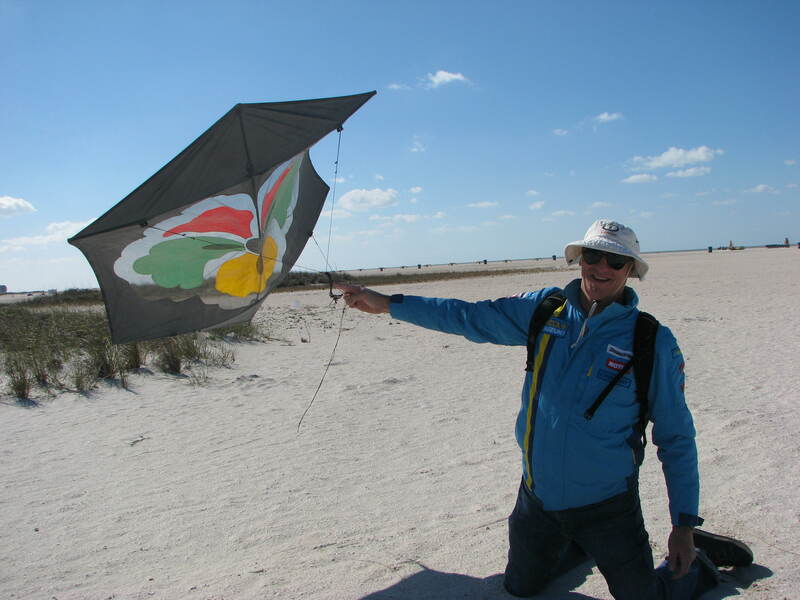 Big Al Sparling, another regular from Chicago, IL, came and flew the big kites. 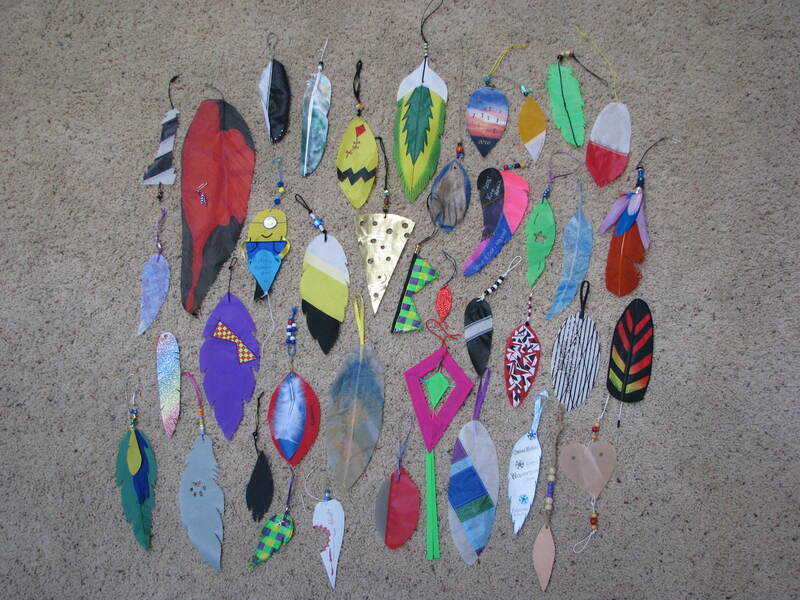 The kids attending the festival decorated and flew small sled kites. 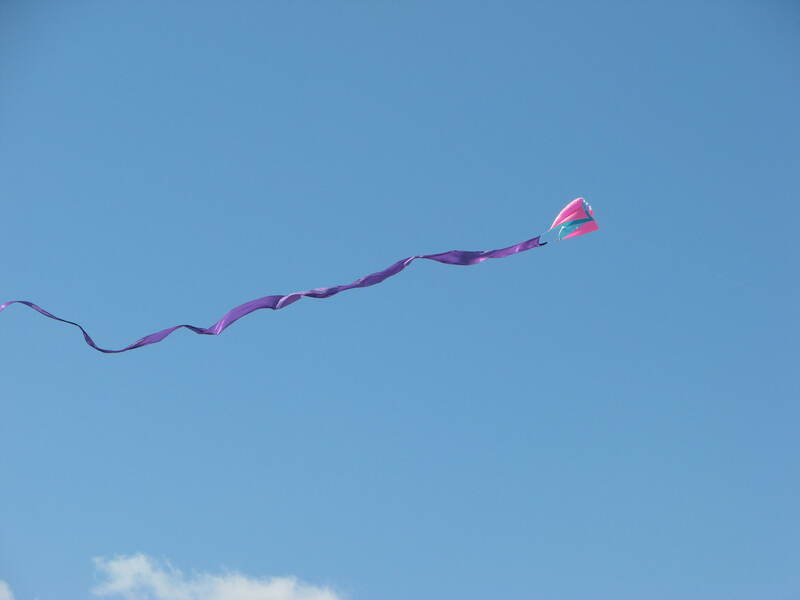 “Purple”, the pink playsail, made an appearance and was a hit. 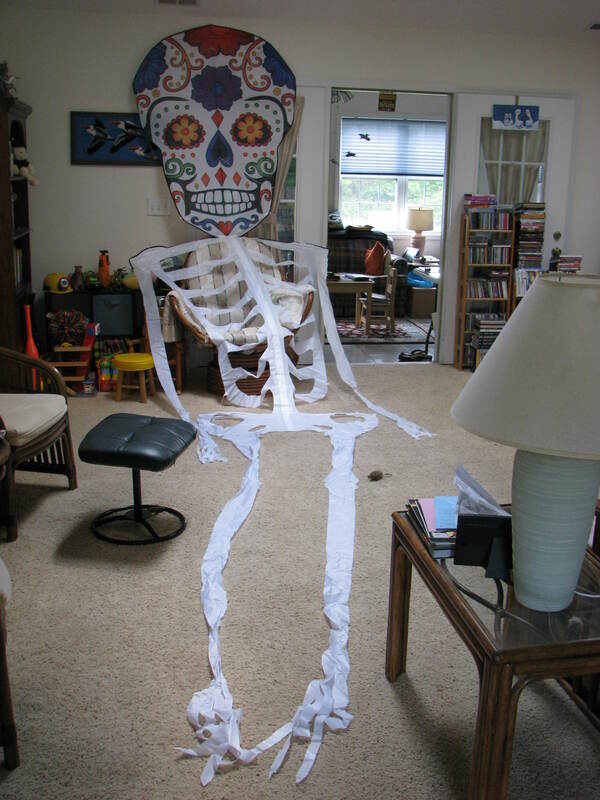 And, of course, so was the candy drop. 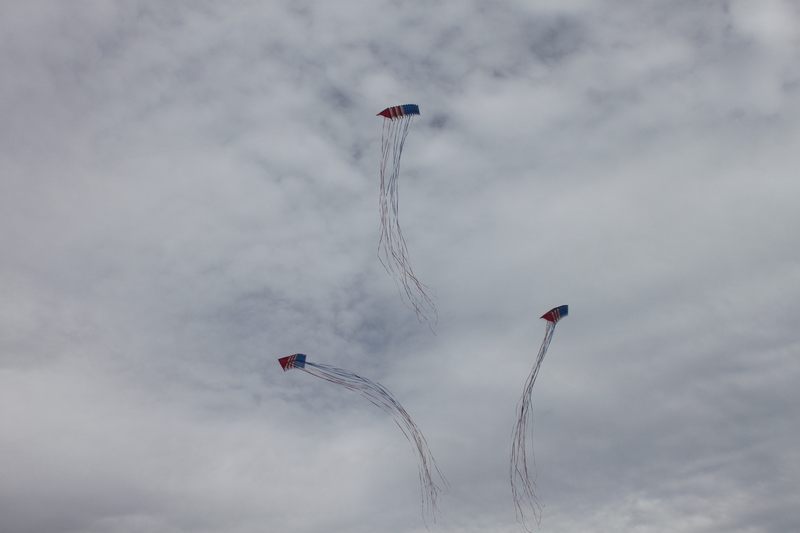 The one of the highlights of the day was the flying of the ribbon kite. 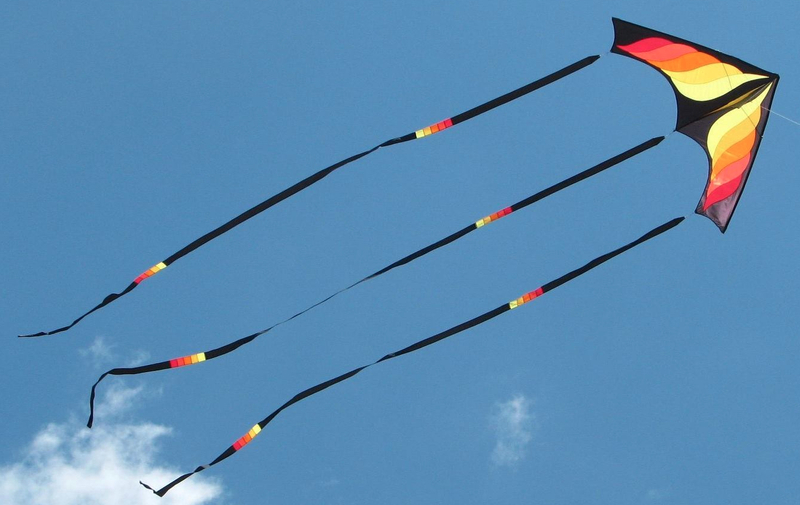 This kite is 440 feet long and is the largest ribbon kite in the world. 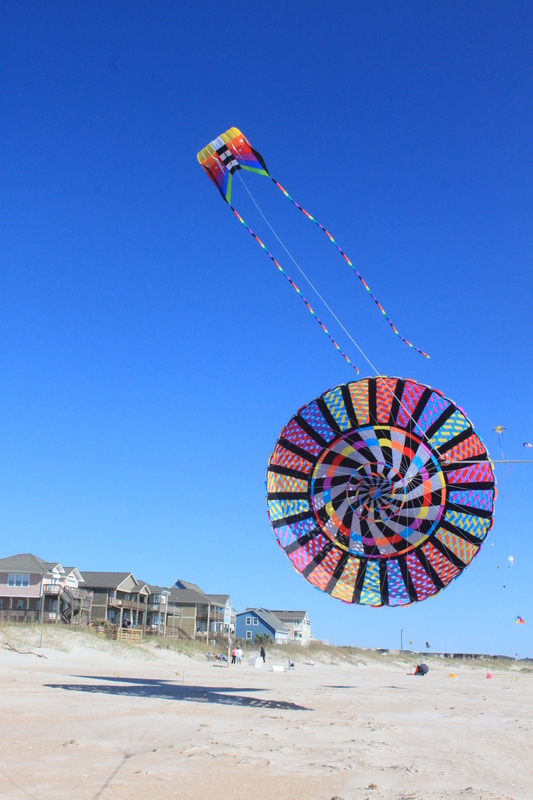 It is handcrafted by Randy Tom, an internationally known kite maker. 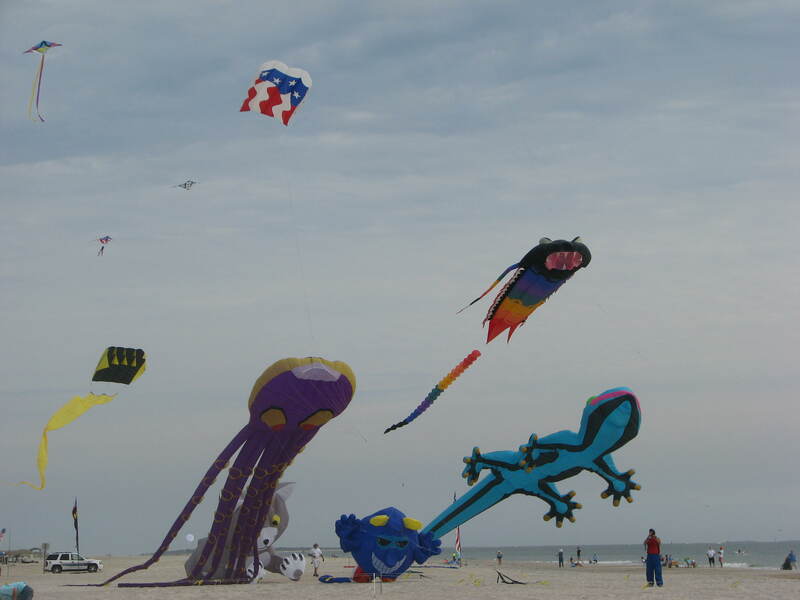 A new guest to the festival was Dodd Gross, a kite designer and a champion stunt kite flyer. 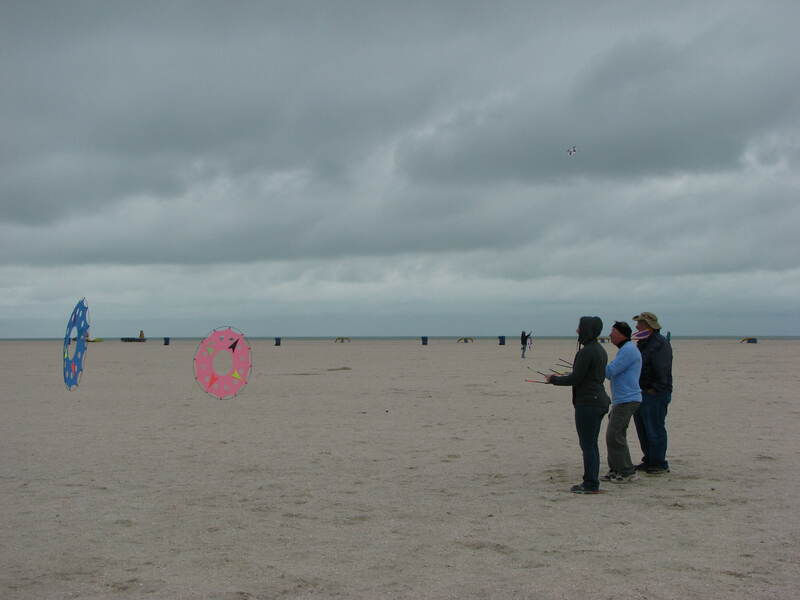 He gave stunt kite demonstrations and seminars. 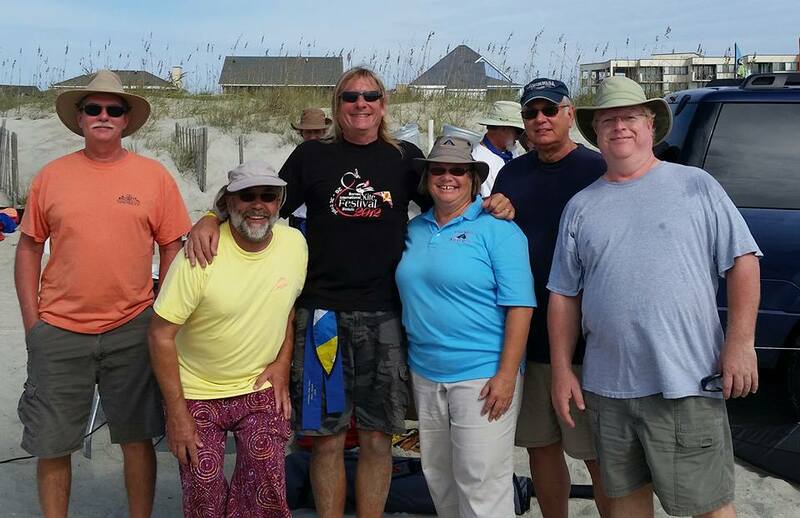 Representatives from two kite companies were in attendance, Jim Christianson of Skydog Kites and Chris Schultz of HQ Kites. 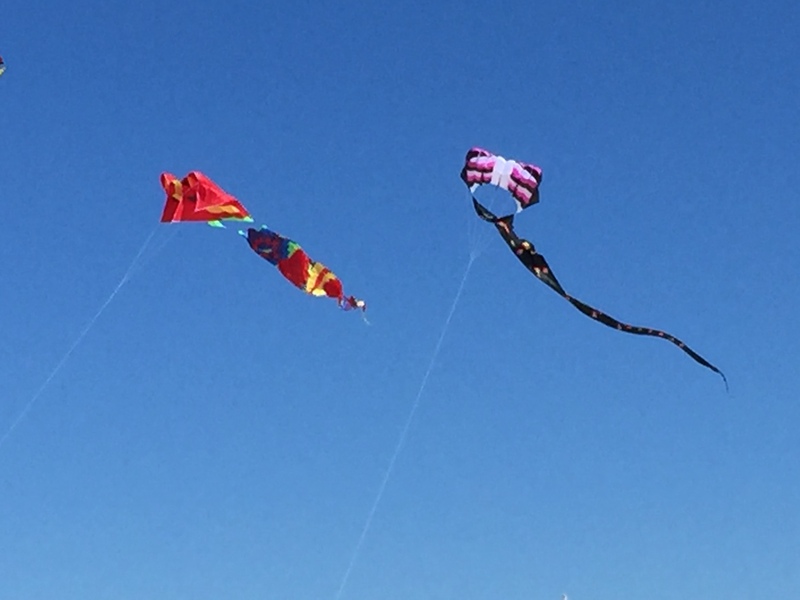 Both flew kites from their respective companies. It was a busy, busy day. 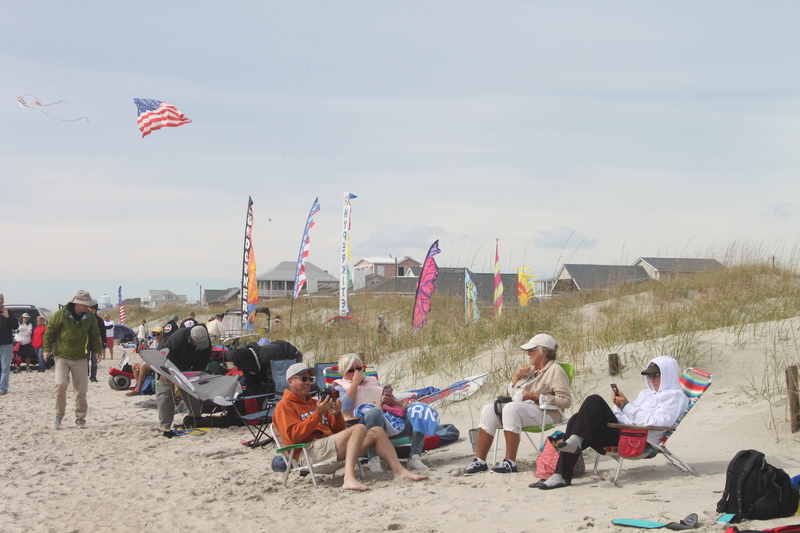 Lots of folks came to see the kites and many brought their own kites and joined in on the fun. That was the key word for the day, FUN! Sunday started out a little disappointing. There was no wind at all. The ocean was glassy and the skies were partly cloudy. 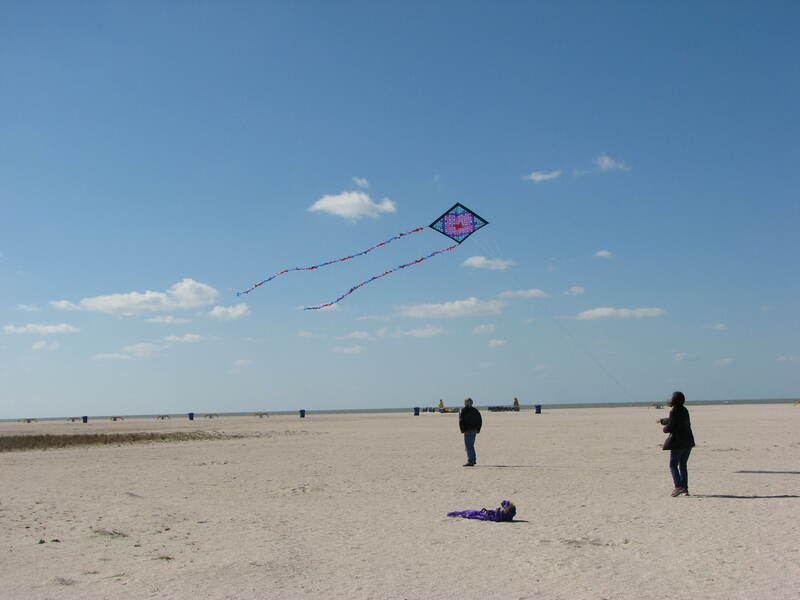 Thankfully, kite flyers are an enterprising group and several got out their fighting kites and demonstrated how to fly with no wind. Yes, it is possible. 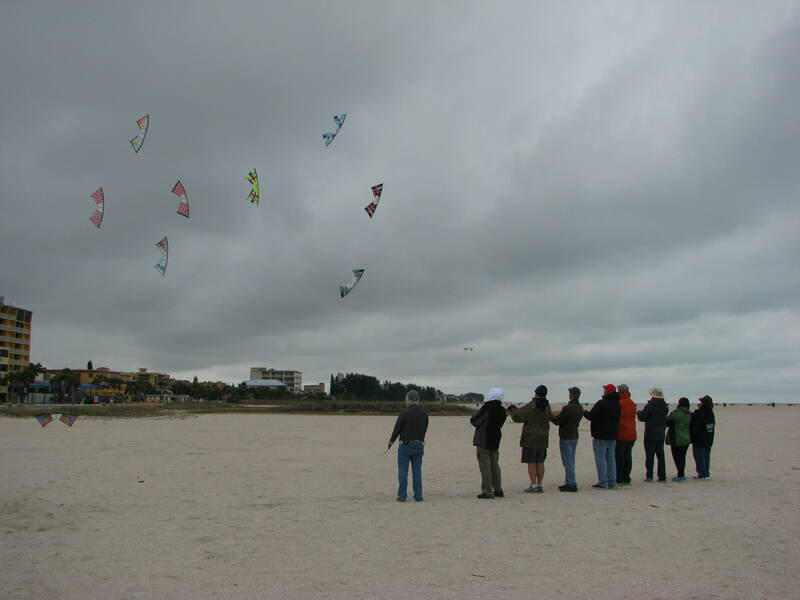 As the morning went on, there came a breath of wind and we got the low wind kites out of the bags and put them in the air. By noon, the winds had increased and become steady. 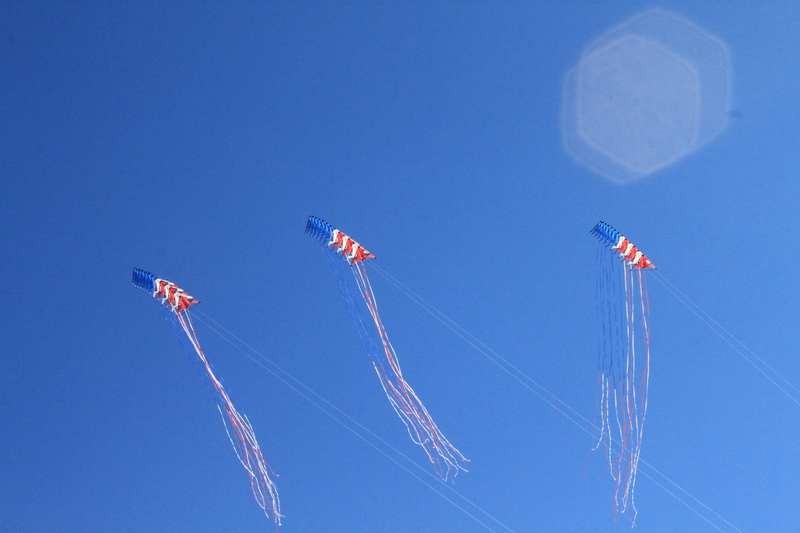 A perfect day for kites. 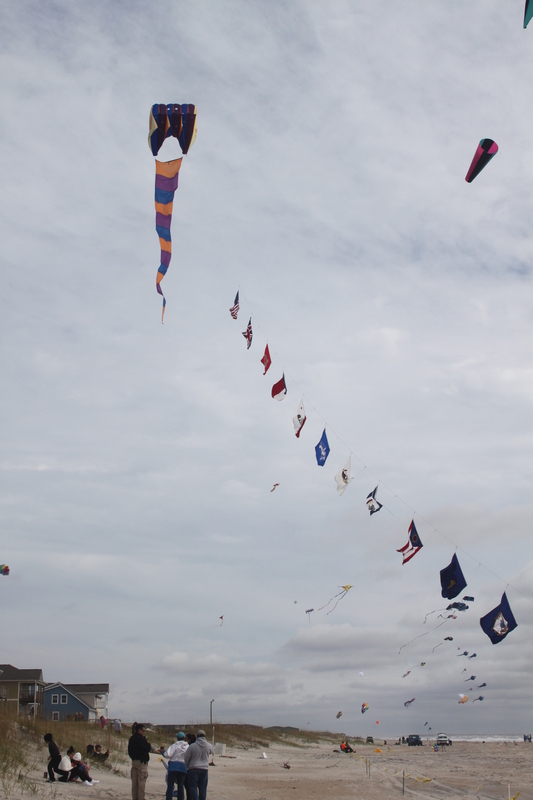 The big kites went up and the mass ascensions and performances began. 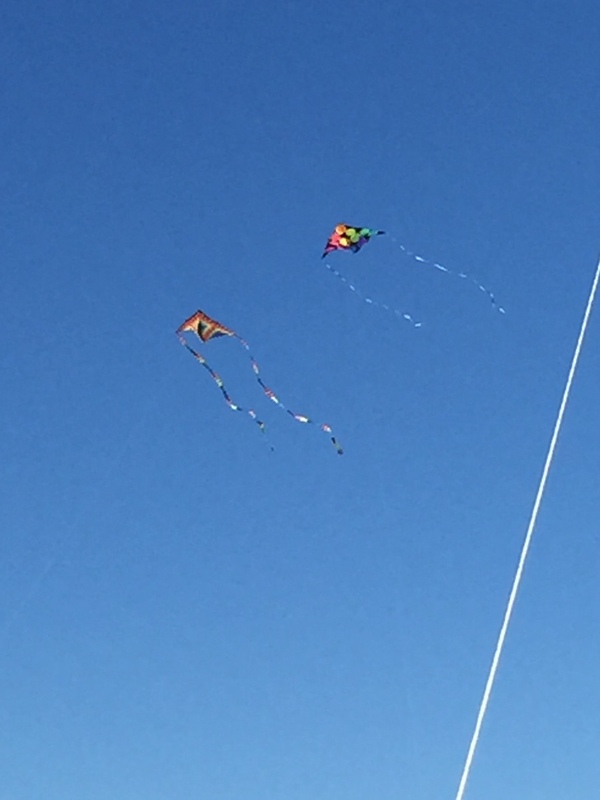 Two mass ascensions of note were the Sky Skimmers and the Kites Unlimited Revolutions. 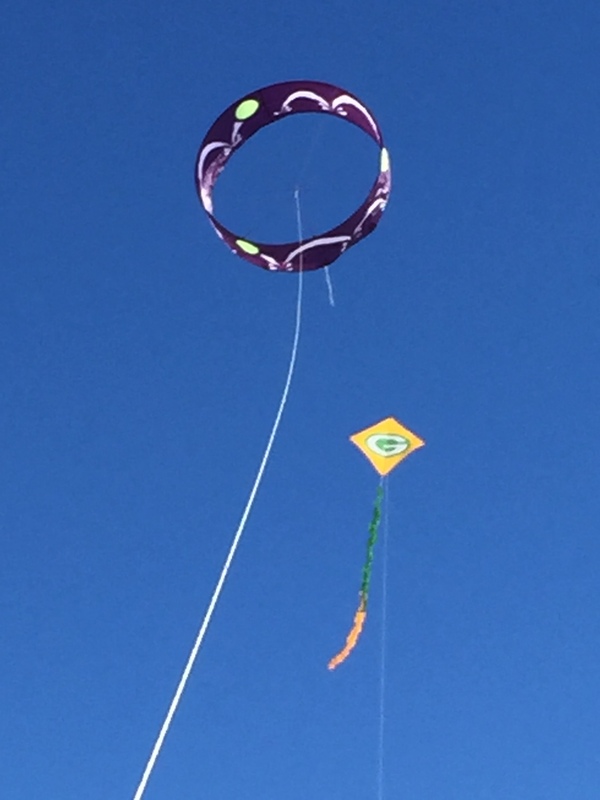 Both of these kites are only available at Kites Unlimited kite shop in Atlantic Beach, NC. 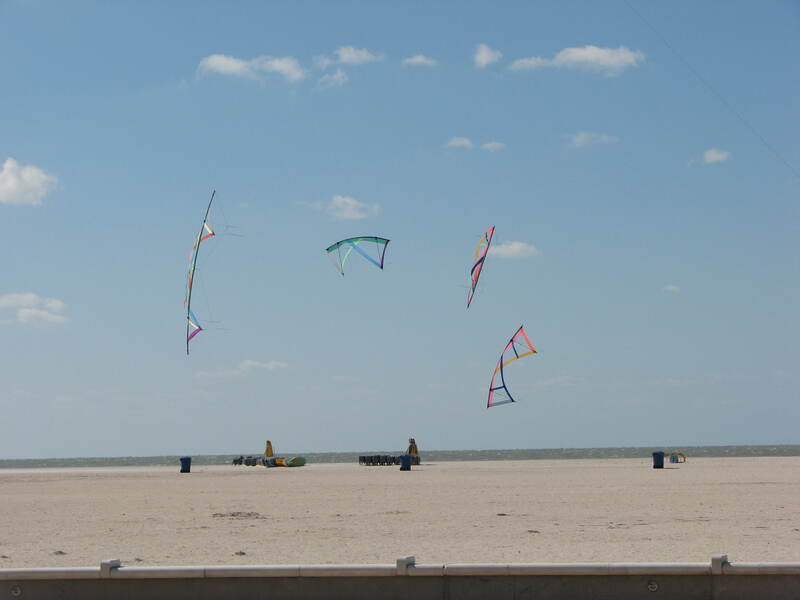 The Sky Skimmers are made by Jeri Dixon, one of the owners of the shop. 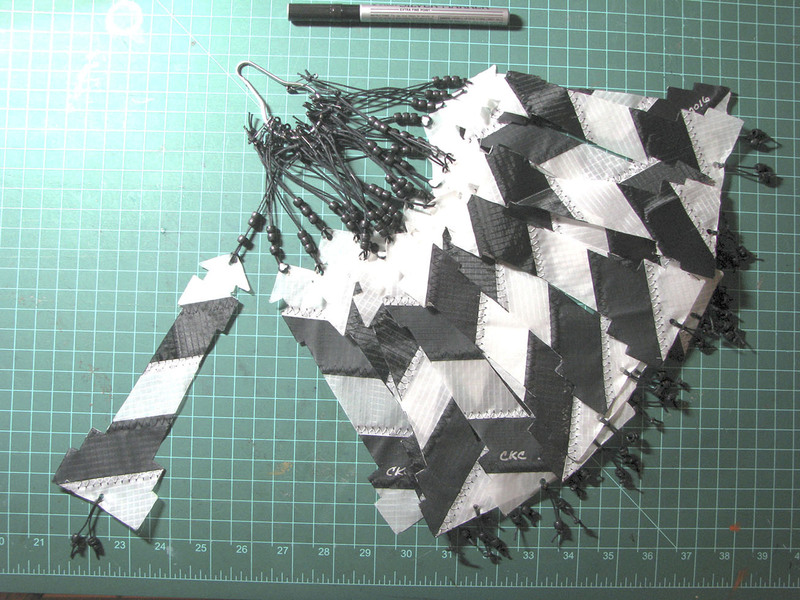 The special black and white Revolution kite pattern are made specifically for the Kites Unlimited shop by Revolution Kites. 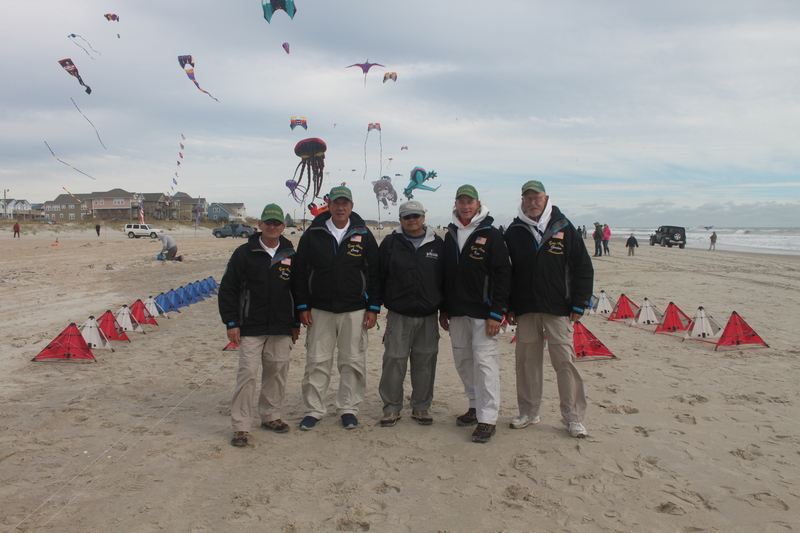 I should mention too that the Hyperkites the Sundowners flew are also only available at Kites Unlimited. This is starting to sound like a commercial but I can’t help it. 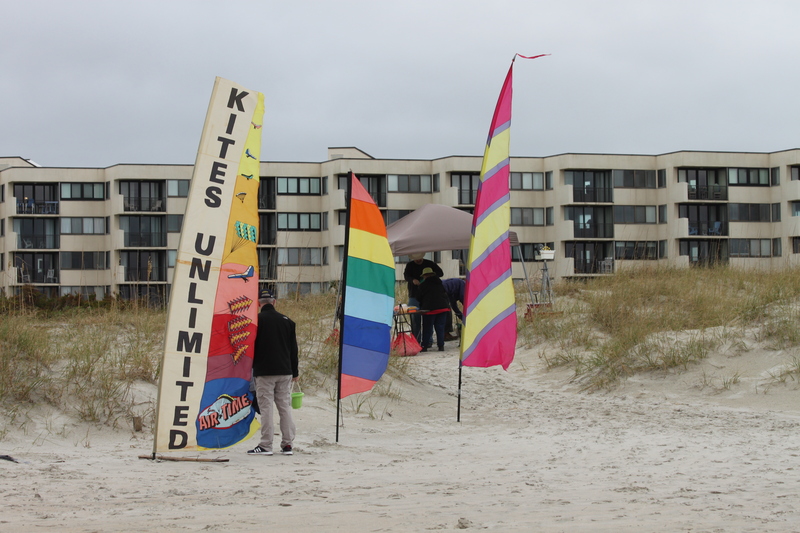 Kites Unlimited is my favorite kite store and the main sponsor of the Carolina Kite Festival. I hang out there way too much. I did something at this festival that I had never done before. I got out in the performance field and flew for the audience. 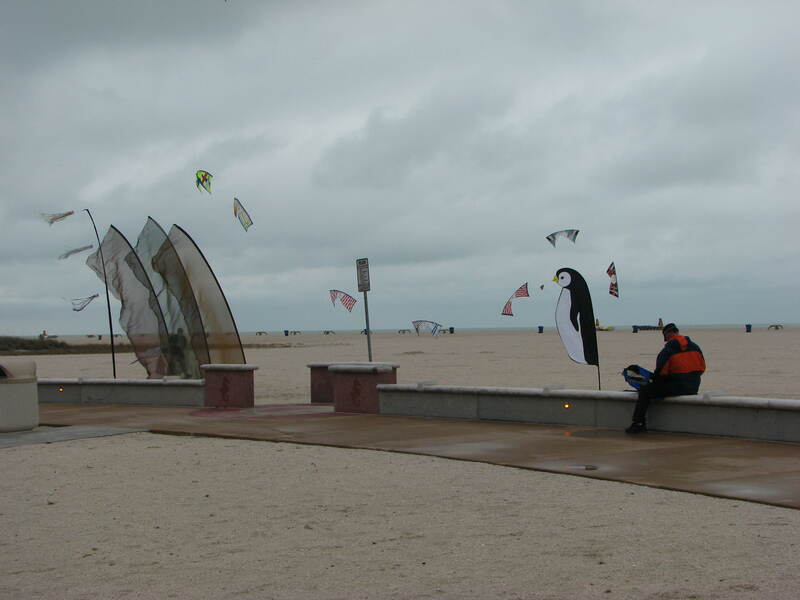 The wind had come up in the afternoon and was blowing steady down the beach. 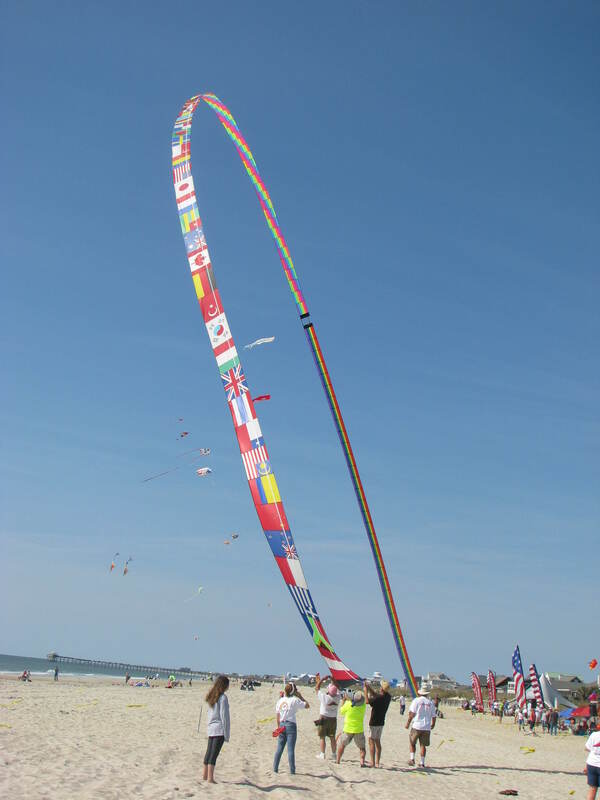 I trained my two Kites Unlimited Revolutions, one full sail and one vented sail, and flew to some music that was playing at the time. It was a spur of the moment thing and went pretty well. It went so well I dug out some music of my own choosing and flew my progressive “Dream” stack. 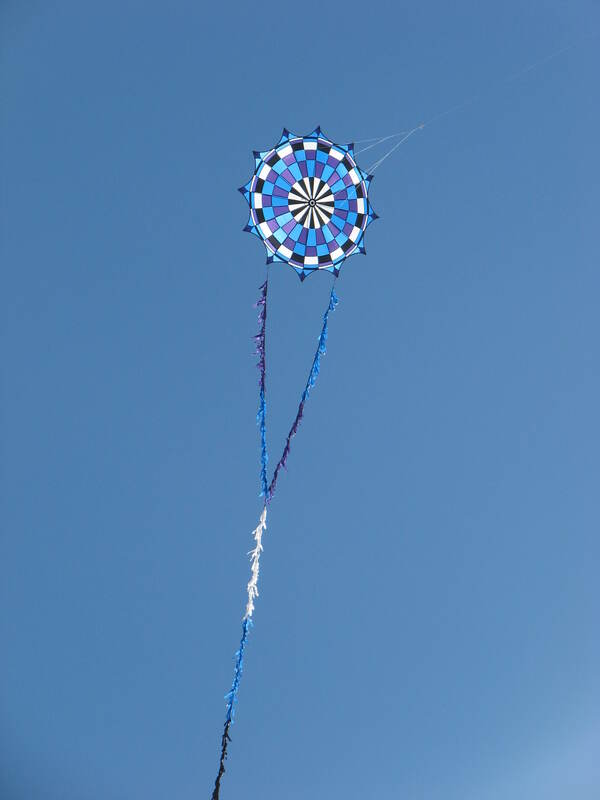 I trained my Dream On stunt kite and my Little Dreamer stunt kite, both designed by Dodd Gross and sold by Skydog, and flew them to the song “Time In A Bottle” by Jim Croce. I lost the wind once on a low pass but put them back up and finished the music. It was fun and I think I’ll do it again sometime. Maybe with a little more practice beforehand. So how do I sum up the weekend? Long days, tiring but fun, Fun, FUN!!!!! 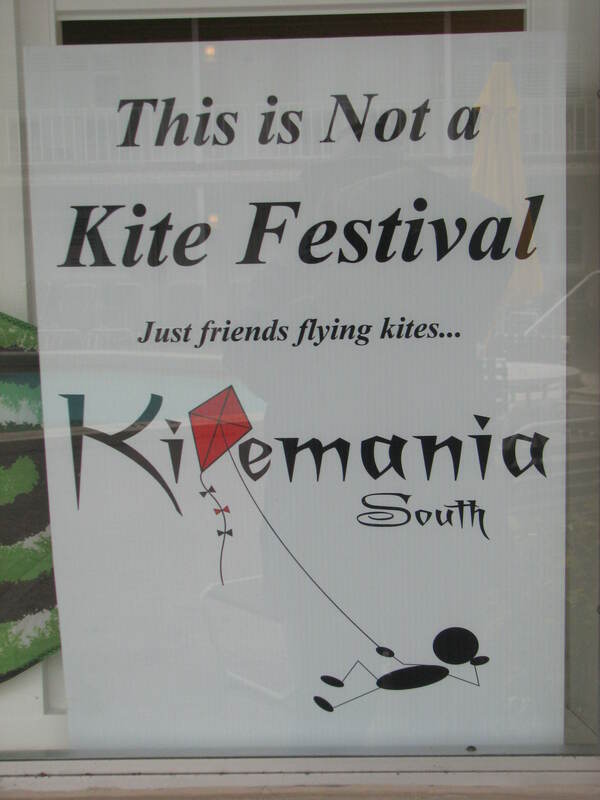 And that’s what kite flying is all about.